Jàla Khan is the reigning megalomaniacal monarch of all bivalves within the Gulf of Morays. He is also the democratically elected regent over all shelled subjects who inhabit the various deltas and tributaries of the God River that extend into the Yellow City. Through a series of strategic assassinations, his mandate has recently been extended to include all limpets and barnacles. He is also a ponderous pain in the rear. In terms of Appearance: Jàla is a surprisingly symmetrical Oyster, exactly the size of the Yoon-Master’s hand (with fingers outstretched). His shell is heavily decorated with extensive pearl bead-work and precious stones. His flesh is ashtray gray and he occasionally sports a fu manchu moustache-merkin made from glossy black sea-camel hair. He has two, olive-sized-and-shaped pink rose-quartz “eyes” that he infrequently remembers to wear whenever addressing non-mollusks. He looks and smells delicious. In terms of Voice: If available, punctuate with castanets (clacking a few resonant dice together betwixt thumb and forefinger works in a pinch). Shoot for semi-sniveling, preferably high-pitched, and avoid large words. Your second best Southern Drawl works as well. When bored (which is interminably often when hearing bootless pleas from air-breathers), expect tuneless whistling. 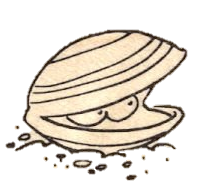 In terms of Influence: The Oyster King is a remarkably savvy twerp, and has clamped down on most unlicensed commerce involving pearls and nacre. He also holds a monopoly on some of the key reagents for Sovereign Glue. Representatives of his kingdom travel far and wide on the hulls of ships and skiffs, and this foreknowledge of trade goods is often used advantageously to short the markets. If pressed into defense of his interests or territory, he can easily muster a troop of a thousand Barnaclids and could potentially raid his coffers to procure at least a legion of Locathah irregulars with a dozen Giant Starfish Siege Engines. He often entertains ecstatic fantasies of razing the Yellow City with such a mighty army, but is far too miserly to expend the resources (it would very likely fail hilariously). He’d rather play the waiting game and stake his claim after the cephalopods make their move. Fortunately, thus far, negotiations with the Squid-Men and the Kraken have been as disastrous as to be expected; and although he would be loathe to admit it, relations with the Topaz Dragon have cooled (the result of a disastrous surprise birthday party). In terms of Foibles & Flaws: Utterly incapable of tolerating alcohol, but when soused is effectively immortal. This is a consistent source of consternation for him. He possesses a carefully curated and opulent undersea harem, but isn’t quite sure why, other than “It must be so.” He has a standing bounty of three chestnut-sized pearls on all woodworkers and walrus (and under no-circumstances will discuss his childhood in Voivodja). Overtly fond of puffery and due-deference, his treatment of air-breathers is typically rude at best and coldly aloof at worst. He detests being referred to as "Snappy," and has ordered Giant Flesh-Eating Oyster mass-executions for less. In terms of Motive*: Vengeance on Vèlô for a slight (possibly perceived). To stock his vestigial Harem. To unite the Crab-Men under his banner (he’s perceptively noticed the girls’ sway over his monstrous bodyguard, Tǃchk). To deprive air-breathers of art and culture. To mend fences with the Topaz Dragon. In terms of Trappings and Capabilities: Irritatingly engulfed in his fleshy folds is his symbol of office and most trusted adviser. A pea-sized black pearl known as We Speak The Will Of Kings. The pearl is an intelligent artefact of commensurate ego to that of the bearer, and allows the anointed monarch to speak all languages and cast several useful high-order spells from the schools of beguiling and enchantment. In addition, he often wears a dweomer-woven tangerine-colored ascot that allows him to Fly and operate comfortably on the surface. He is also in the possession of a gaudy green Kwalishi Submersible that he has been known to infrequently hire out (at exorbitant rates) to adequately deferential air-breathers in need of such things. HD: 8+3, AC: 0 , #ATT 2, Dmg: d4+3/ d4+3, Move 30 (90 fly), ML 7, Save As: F8. Seldom encountered alone, usually has a retinue of at least 5d12 max-HP Barnaclids, or a praetorian guard of elite Crab-Men (at least a score, HD: 6+6). When taking in a show in the Yellow City however, it may be possible to encounter the pragmatically frugal Jàla atop a black velvet and ermine-edged pillow, with only a single bodyguard (the titanic Tǃchk). *This section is for the adventure I'm currently tapping away on in idle moments. Until it is finished, I intend to tease out a bit of content here and there. Hopefully, my fellow Yoon-Masters will find some use in it.